After an I-Team investigation last year, the practice known as pension double-dipping has emerged as a campaign issue in the race for Bergen County sheriff in New Jersey. Sheriff Michael Saudino, a Republican, takes home more than a quarter million dollars in combined salary and pension. That makes him the highest compensated sheriff in the state, and his challenger is using that to promote a plan that would curtail the practice in the future. Double-dipping, as critics call it, is when government employees retire early and begin collecting retirement benefits, only to then take other government jobs and collect full-time salaries. Last year, the News 4 I-Team partnered with NJ Watchdog to investigate expensive pensions among Garden State law enforcement officials. The inquiry found 17 of the state’s 21 sheriffs collect public salaries and public pensions at the same time. 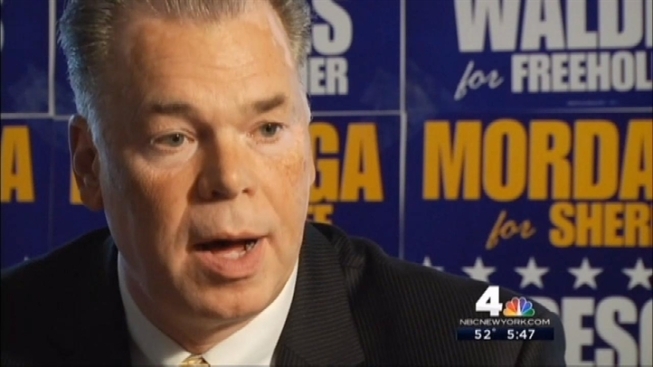 Saudino’s challenger, James Mordaga, a Democrat who has served in various Bergen County law enforcement positions, told the I-Team he would reduce the salaries of employees who double-dip if he is elected. “As sheriff, I would have control of my budget and I would be able to reduce my salary and the salary of my appointed staff,” Mordaga said. Mordaga mentioned cutting his own salary because, if elected, he would also collect a salary on top of a pension. He retired from the Hackensack police narcotics unit at age 45 and has been collecting $75,600 in annual retirement benefits ever since. Mordaga says he would cut his own salary by 25 percent – from $138,000 to $103,500. Saudino said his challenger’s proposal to reduce salaries for himself and other double-dippers is politically convenient. “The thing I find most hypocritical is my opponent, prior to making this accusation to run for sheriff, has held two positions where he collected his pension and salary,” Saudino said. Indeed, after retiring from the Hackensack Police Department, Mordaga took jobs with the Bergen County Prosecutor’s Office and the county Department of Public Safety. In both capacities he worked full-time even though he was collecting retirement benefits. Collecting pensions and salaries concurrently is pervasive among members of both political parties. The I-Team/NJ Watchdog investigation found eight Democratic sheriffs and nine Republican sheriffs who take home both forms of compensation. In addition to the 17 New Jersey sheriffs who simultaneously collect salaries and pensions, the investigation found 29 New Jersey undersheriffs who engage in the practice. During his tenure, Saudino has appointed four undersheriffs who accept salaries on top of their retirement benefits. There is now a bill in the New Jersey Senate, sponsored by Republican State Sen. Jennifer Beck of Red Bank that would ban most public employees from collecting pensions if they accept full-time government work. That bill has not come out of committee.